The DC-based group Food & Water Watch has released a new report that questions the claim from the oil & gas industry that fracking will make the US more energy independent. Just as people have exposed the Tar Sands project as a false energy independence plan, we now have more evidence that the rush to frack for natural gas across the country is primarily a means for exporting and greater profits. Even if the highly uncertain estimates of “tight oil” reserves prove accurate, and even if the oil and gas industry wins unrestricted access to drill and frack for oil, the estimated reserves would amount to a supply of less than seven years. The threat is that the fossil fuel industry — empowered by its deep pockets, armed with increasingly intensive extraction methods and bolstered by entrenched infrastructure and demand for its product — will succeed in delaying the necessary transformation for decades, just to protect its bottom line. Now is the time for the United States to declare independence from the oil and gas industry. Food & Water Watch also offers up some recommendations, which we find to perpetuate the current economic system. The failure to discuss climate change, the US military industrial complex and the need for a drastic reduction in carbon emissions is most unfortunate and ultimately will mean that there might not be a real sustainable future for humanity. However, beyond the significant short-comings of the report, the information is useful for the anti-fracking movement and should be used for that purpose. The report makes clear that climate change is THE primary reason we must transition away from fossil fuels. That is made the subtext of the above excerpt. It is true that the report does not tackle the US military industry…but jeez! one thing at a time! Hugh, when presenting recommendations, the report talked about economic growth, which I see as an indication that the US can use renewable energy to maintain business as usual in terms of the neo-liberal capitalist system. Also, if we are serious about climate justice, we can not leave out the military industrial complex, since it is the largest consumer of fossil fuels on the planet. In other words, we must have a more holistic and comprehensive plan if we are serious about averting major climate disaster. Sorry the report didn’t meet your expectations. 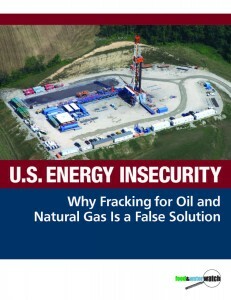 It’s aim was to directly address claims that fracking is the ticket to energy security. Hugh, it’s not about meeting my expectations. I acknowledge that the report is useful for those doing anti-fracking work, which includes me. However, I believe it is important, indeed necessary to be more comprehensive in how we address these issues, particularly since so much is at stake. I use Food and Water Watch reports all the time and appreciate the research they do, but that doesn’t mean we shouldn’t challenge each other on the bigger picture. You say that we fail “to discuss climate change” and fail to discuss “the need for a drastic reduction in carbon emissions”, when we don’t — we call for ending fossil fuel dependence. Saying that massively deploying renewable energy and energy efficiency technologies has the added benefit of creating and sustaining jobs is selling out to the neo-liberal capitalist system? You fail to address climate change in any substantive way, meaning you are only addressing the need to reduce dependency on fossil fuels, but you don’t provide any real plan of action of how to do that, especially outside the current capitalist model. You also don’t discuss the need to drastically reduce carbon emissions, by acknowledging the larger socio-economic shifts that would have to take place in order for the planet to reduce carbon emissions by 80% of the current levels by 2050, which is what the IPCC has said needs to take place. And yes, just using renewable energy and energy efficient technologies without looking at larger issues of 21st century capitalist consumption is an inadequate plan if we are to avert major climate disaster. What the report and Food & Water Watch in general advocates for is Green Capitalism, which I don’t believe is really sustainable. Read Heather’s Rogers book “Green Gone Wrong” or “Deep Green Resistance” or “Tropic of Chaos: Climate Change and the New Geography of Violence,” just to name a few.